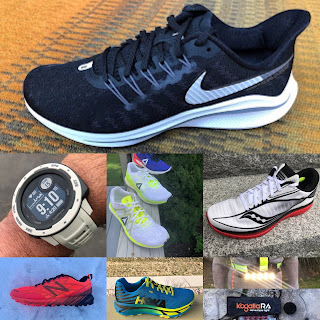 Road Trail Run: Nike Zoom Vaporfly 4% First Impressions... On My Foot! 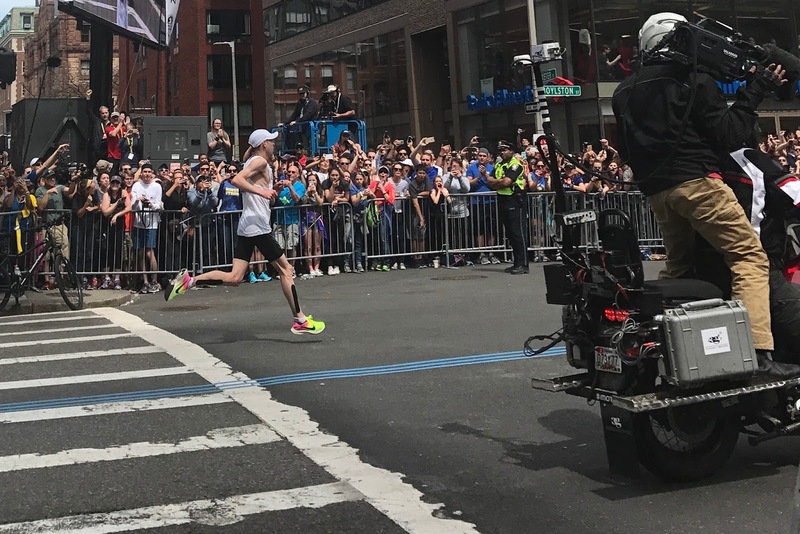 Action Shots of the Boston Winners Wearing Them. Nike Zoom Vaporfly 4% First Impressions... On My Foot! 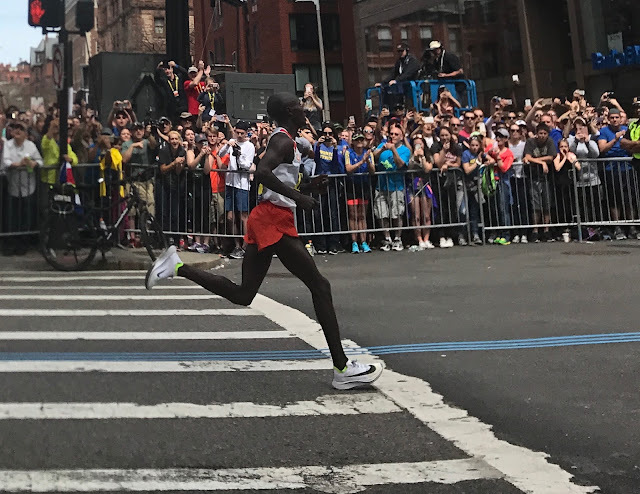 Action Shots of the Boston Winners Wearing Them. 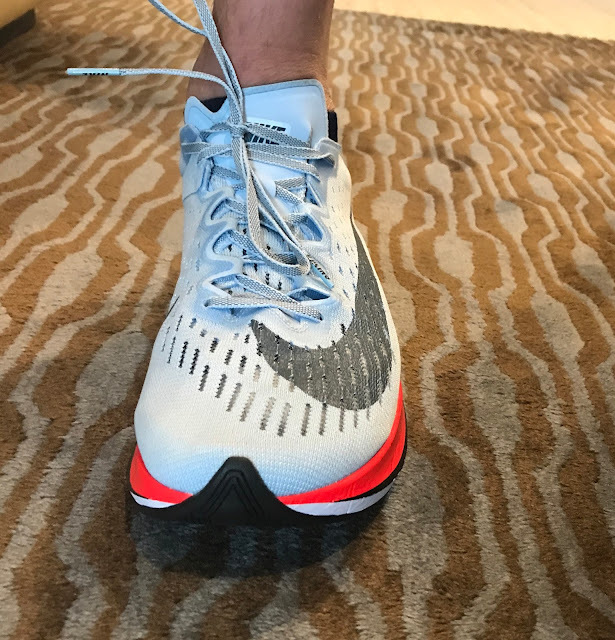 I was fortunate to spend some time with Nike at the Boston Marathon where they let me try on a single Zoom Vaporfly 4% ($250, Available July) I trotted around a hotel lobby to get some first on the foot impressions of this exciting new road racing shoe, worn by the men's and women's winners of the 2017 Boston Marathon a day later. The Zoom Vaporfly 4% was designed to optimize running economy and reduce fatigue over the marathon distance as part of Nike's Breaking2 project. Taking a completely different direction from the usual firm, minimally cushioned elite racing shoe such as the Zoom Streak 6, the Vaporfly has 30mm of heel and 21 mm forefoot stack, taking the stack realm of well cushioned daily trainers and in fact within a millimeter or so of Nike's Pegasus and Vomero trainers. Yet... they will weigh only 6.5 oz in a men's US 10 according to Competitor. 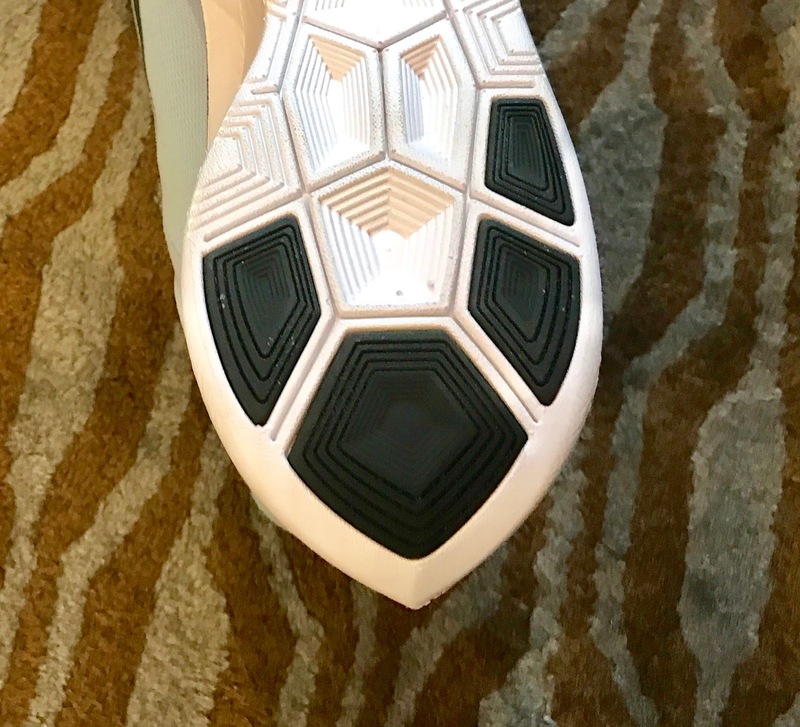 Not visible from the outside, a full length uni directional carbon plate is embedded about 10mm below the foot sandwiched between 2 layers of a new midsole compound called ZoomX. Zoom X is 1/3 the weight of standard EVA and has 13% better energy return. 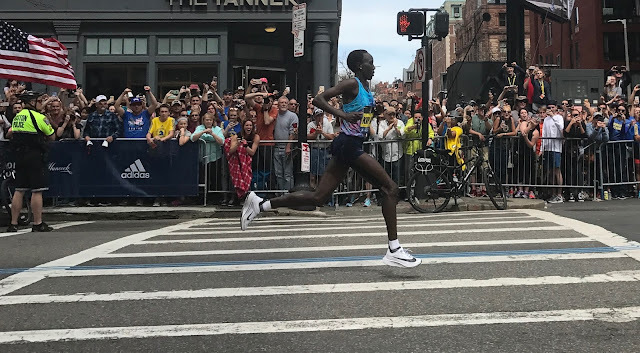 The "scooped shape" carbon plate is designed according to Nike to take advantage of the known benefits on running economy while mitigating the effects of such a stiff plate in shifting workload from the foot to the calf. 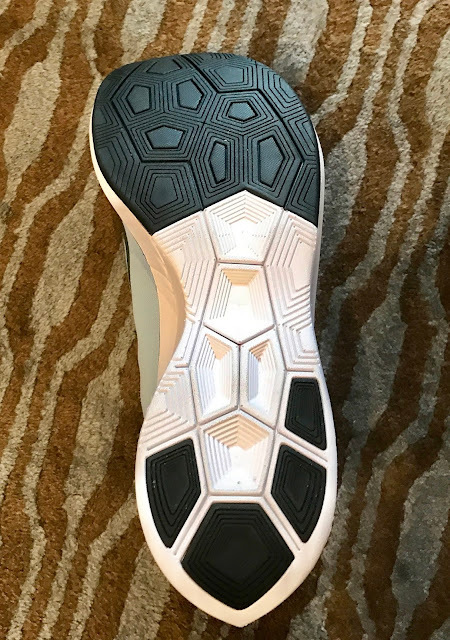 The plate is roughly in the location of the black line on the midsole, dipping down steeply at the ball of the foot then curving up towards the toe. The shoe is completely stiff. I was not able to hand bend it at all. There is more rear of the shoe upper reinforcement on the medial side, above, than lateral side below. The upper is very minimal, just a single layer of Flymesh with a soft heel counter. Unlike the tuned down slightly heavier Zoom Fly ($150) there are no Flywire cords evident. Update: read our first impressions review of the Zoom Fly here The combination of high stack and minimal upper raises some stability concerns. 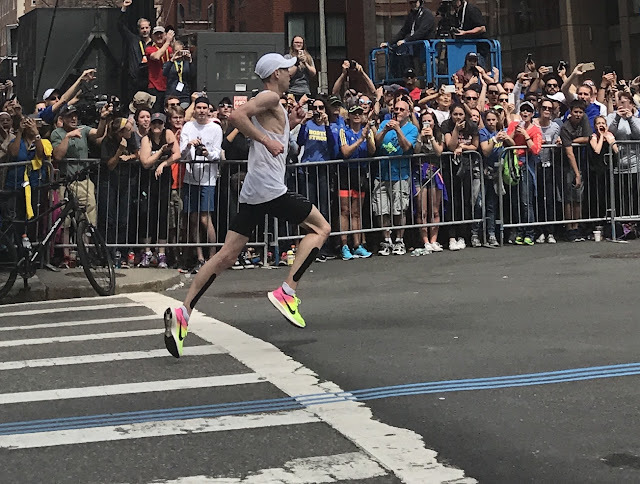 We noticed that Galen Rupp's version of the Vaporfly 4%, worn to 2nd place at the Boston Marathon, may haver had the more supportive upper of the Zoom Streak 6. The heel midsole has a streamlined shape intended to improve aerodynamics and I would imagine also reduce weight. The red stripe is a bit of stiffener for the heel counter. The left Vaporfly 4% Nike brought was size 9. I am usually a size 8.5. There is no question with the roomy soft minimal upper runners will want to go true to size as going larger may cause instability and in my view is unnecessary, Below I am wearing a Zoom Kiger 4 in my true to size on the other foot. The Tiger 4 trail shoe is relatively snug the Vaporfly is not. The Vaporfly does not lack for outsole rubber, particularly in the forefoot. 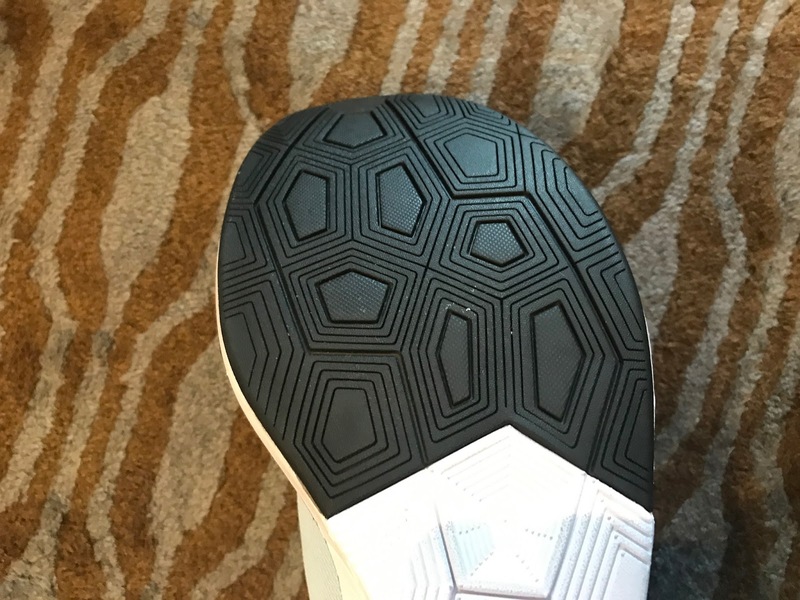 I really like a full coverage forefoot outsole. It contributes to stability and a smooth toe off. It was unclear how thick or durable the outsole is but it looked substantial enough that many, including me would be tempted to use them as an uptempo daily trainer, with Shoe Goo my friend. I do worry a bit about the heel wear at the outer edges The combination of minimal upper, high stack, and pointed heel when tired and back more on the heels may be a bit unstable but testing will tell. 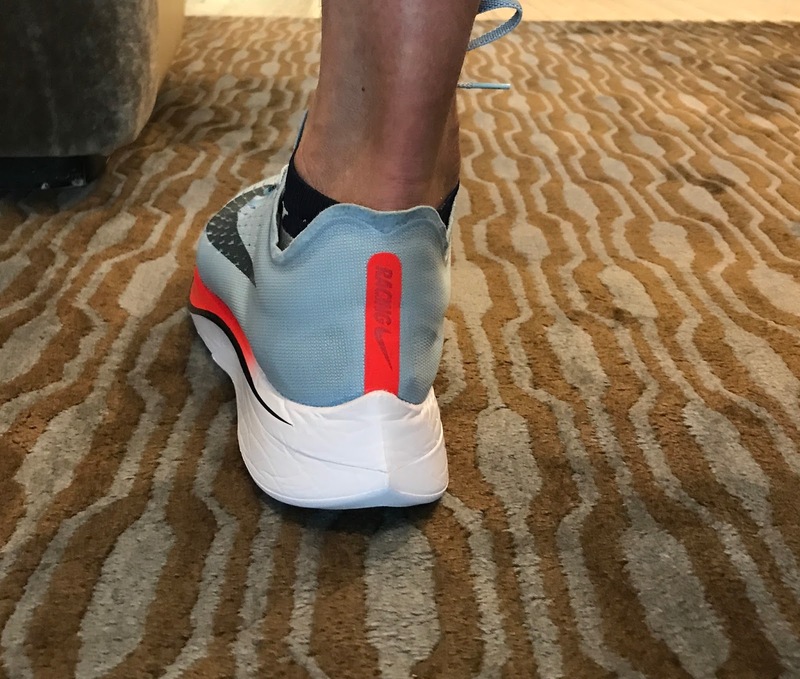 I trotted around a hotel lobby with the Vaporfly on one foot and the Kiger on the other. For sure a very brief test but distinct first impressions were had. They don't feel soft or mushy yet do feel very cushioned. I had the distinct sensation of a brief, soft pleasant landing coming to gentle but distinct end, then beginning to direct forward by what I assume is the compression of the midsole reaching the plate. Then, and this was special, as my foot moved forward to toe off a noticeable yet not abrupt sensation of tipping forward as if I suddenly was headed gently downhill with each stride or that feeling when the boogie board starts to plunge when you catch a wave. There has been talk that the Vaporfly plate is a spring but I think not. More a wave effect between foot and shoe to optimize stride and forward momentum. I had no sensation of being "sprung" off the ground. It was more a rolling sensation. The lightness with such cushion was incredible. 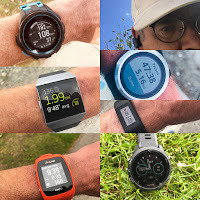 The closest comparison I can think of is to the Hoka Clayton 2 but here less shock seems to be transmitted and the stiffness, and the Clayton is stiff too, is less noticeable as the plate flows forward better than the rocker approach of the Clayton. How did the Vaporfly perform at the 2017 Boston Marathon? From my perch at the Lenox Hotel I saw the men's and women's winners fly by in the Vaporfly 4%. No question they had what looked like decently fresh legs and seeing such a "big" shoe flying by at top speed was unique. At even $250 the Vaporfly 4% will be for sure sought out by a wider range of runners, including me, than the usual race shoes and performance trainers such as the Zoom Streak 6 and even the Zoom Elite 9 for its incredibly light weight, great cushion, versatility and performance characteristics. I can't wait to run some miles in them, if I can find a pair. The lower cost Zoom Fly ($150) while heavier, but at a still very reasonable 8.5 oz in size 10 is made of different materials including a more forgiving plastic inner plate, Nike Lunarlon foam instead of Zoom X and has a touch more stack at 33/23 according to Competitor. It should also prove popular. Sam is a 1:38 half marathoner on a good day and doesn't mind at all going into a new decade age group in 2017. He runs approximately 40 miles per week. He is the Editor and Founder of Road Trail Run and has been running for 45 years and has a very dated marathon PR of 2:28. Sam is also the Senior Contributing Editor for Fitness Wearable Technology at Competitor Magazine. Pretty sure Galen was wearing the same shoes from Rio, not the new 4% shoe. On an unrelated note: the way you tie your shoelaces, I'll bet they come undone a lot. You've made a granny knot, not a square knot. When you make the initial half-knot with your laces, try swapping the order of left-over-right or right-over-left that you're used to doing. Then make the loops and finish knotting your laces as usual. The bow will lie across your shoe (instead of along it), and it won't untie itself. How does ZoomX feel when compared to Boost? Hi Dickson, only had a very few minutes in the 4%. This said I felt Zoom X smoother and slower to compress yet soft Boost bouncier and less consistent. All this maybe...I will have a pair very soon. how about the sizing compare to zoom streak 6?? You can also follow us on Facebook, Twitter, YouTube and Instagram where we publish interesting run related content more frequently as well as links to our latest reviews. Shopping through links on articles help support RoadTrail Run and is much appreciated. thanks for your fast response.. im lil bit confused because i wear zoom streak true to size is very tight.. but i wear US 9.5 for zoom streak 5, the toe is very roomy.. i wear the zoom fly sp US 9 (true to size) its tight, but still okey..
Yo, How the sizing compare to pegasus 33? ?